Powerful nutrients of lactobacillus fermented wild ginseng adventitious roots make your skin healthy and keep skin smooth, elastic. It fills the skin with concentrated ingredients both inside and outside skin. It means "Be the first to shine with wild ginseng", which means "fermented product extracted from wild ginseng adventitious roots". and nutrients carefully and presents you the special noble essence GINCHOWHA YEO AN. 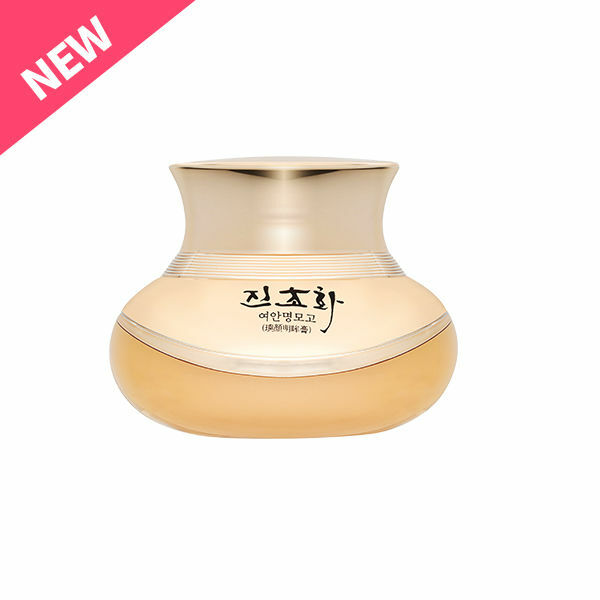 It was born after a long study of the Hwajin Cosmetics Co., Ltd, the fermented product extracted from wild ginseng adventitious roots, GINCHOWHA YEO AN! Contains fermented product extracted from wild ginseng adventitious roots, peony root, walnut, astragalus membranaceus, peach tree leaf, sophora root, mulberry root, pine seed, licorice, siegesbockia herb, rabdosia rubescens, fomes officinalis (mushroom), fleeceflower, echinacea purpurea, Vitamin C, tocotrienol and etc. and provides plenty of nourishment to the skin. Lactobacillus fermented product extracted from wild ginseng adventitious roots active saponin effect makes skin healthy and vibrant, and helps to make skin smooth and elastic. By applying a pressure of 25,000 psi, the solution is made into a small particle, which allows the skin to pass through the gap between the skin, increasing the absorption of good ingredients to help the skin stay healthier. Human body application test results for evaluation of primary skin irritation caused by skin patch revealed that 4 types of GINCHOHWA (e.g., Yeo An Toner, Yeo An Emulsion, Yeo An Essence, Yeo An Eye-Cream) were placed on the skin for 24 hours and no irritation was observed 30 minutes, 24 hours or 48 hours after the removal. The average skin reactivity was 0.00, which was determined to be non-mutilized according to the judgment criteria. Gives elasticity and nourishment with a luxurious touch that sticks to the soft and wrinkled eyes.